The Catalina 400 offers three notable benefits over other yachts in her class. Her super wide cockpit and twin helm layout makes for an amazingly accommodating outside space — years before twin helms became the norm for yachts this size. Below decks, this extra beam affords a huge owner’s stateroom aft with a centerline queen berth with easy access from both sides of the cabin. Third, extra beam amidships leading aft leaves a ton of space for an amazing galley. Catalina built their first yachts in 1969 and immediately made their mark on the cruising word with the innovations of designer Frank Butler. Over the following five decades, Catalina has produced a number of outstanding yachts, winning accolades and industry awards including fifteen ‘boat of the year’ awards thanks to their quality and continued innovation. This Catalina 400 debuted in 1995 as a new and expanded version of their 380 model. They would go on to build 353 copies of this model over the next 17 years, a testament to the design and build quality of this yacht and the Catalina brand. This Catalina 400 debuted in 1995 as a new and expanded version of their 380 model. They would go on to build 102 copies of this model over the next 17 years, a testament to the design and build quality of this yacht and the Catalina brand. On any yacht, the cockpit is the most important space aboard. 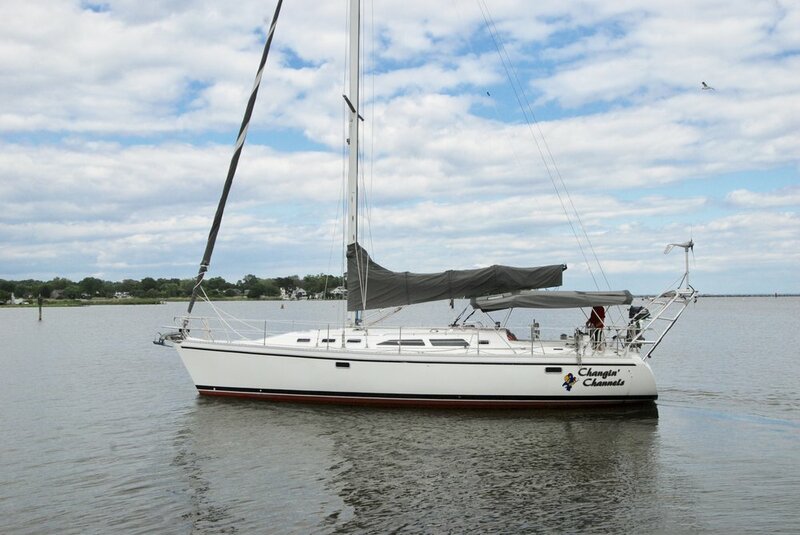 It is where you spend the majority of your day whether it is sailing, relaxing, or enjoying a nice evening meal aboard. The Catalina 400 design does a great job of providing a spacious and functional area, especially with the yacht’s beam carried so far aft. The twin wheel configuration allows for easy passage space from the sugar scoop swim platform all the way forward to the centerline companionway hatch. All rigging leads aft and the primary winches are easily reachable from each helm, making single-handing a breeze. 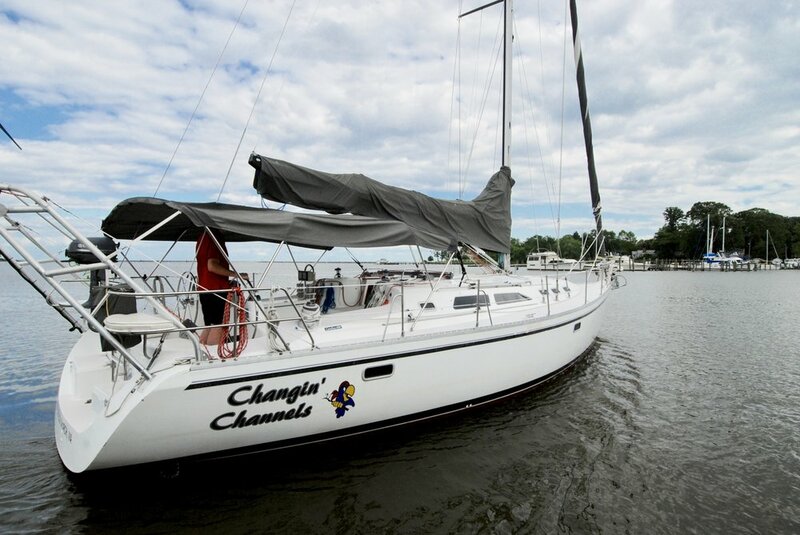 CHANGING CHANNELS has a flaking main sail with a Dutchman system for easy handling as well as a roller furling headsail. All of the rigging leads aft to the cockpit. With large primaries within reach of each helm, this yacht can easily be single-handed. The yacht also has autopilot, which allows you to completely step away from the helm to tweak sail shape. The decks of the Catalina 400 are easily navigable with wide side decks offering an easy path forward to the bow. No exterior teak means low maintenance! 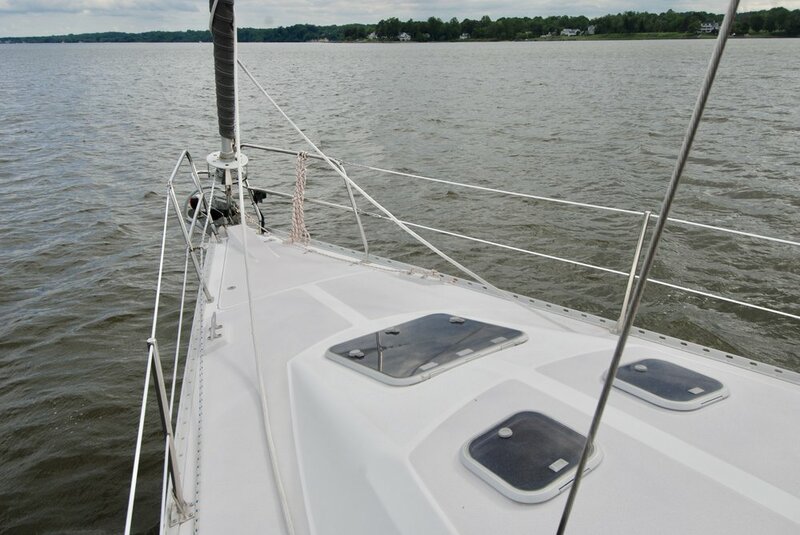 Stainless steel grab rails lead forward along the cabintop which is an easy step up from the side decks. The aft swim platform offers a comfortable and easily boarding location for swimming, getting aboard the dinghy, and getting on and off from a floating pier. Port and starboard board gates provide easy passage through the lifelines. 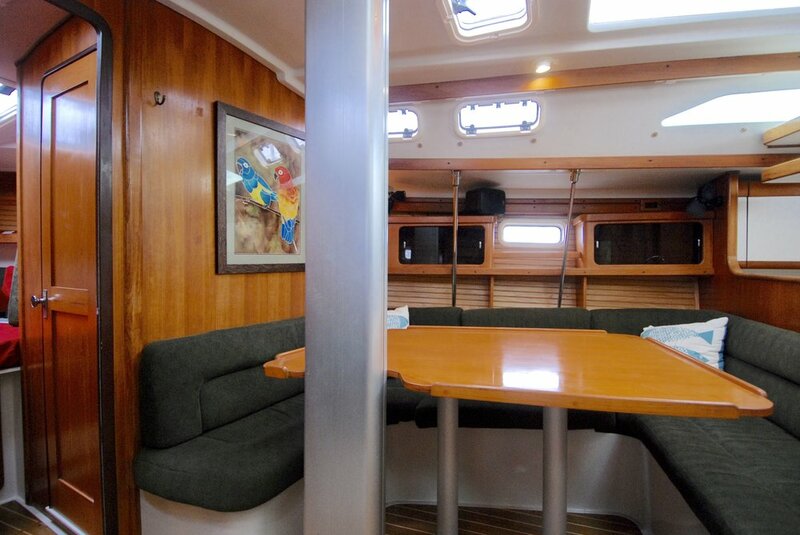 Below decks, you will find a warm rich and inviting interior space for lounging at the end of a cruising day. A gourmet galley lies to starboard, nav station to port, and a spacious main salon that takes advantage of CHANGING CHANNELS’ 13’5’’ beam. Reverse-cycle marine air conditioning and heat help make the salon a comfortable lounge space year round. 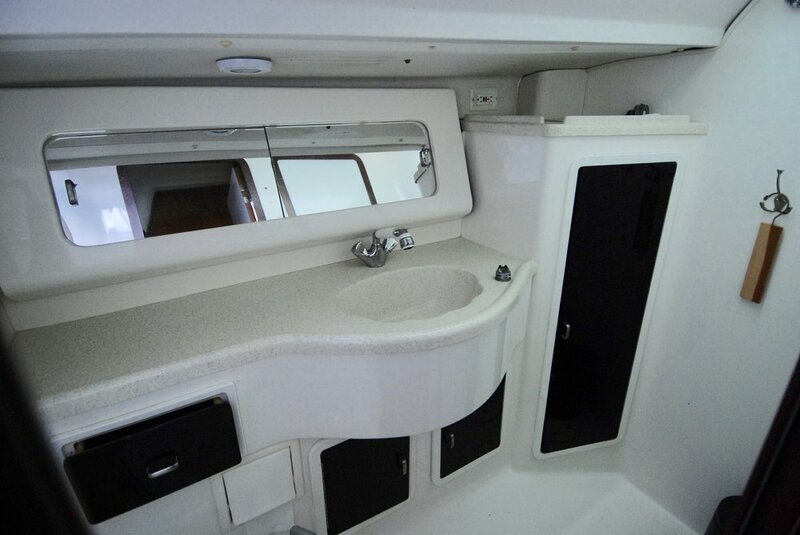 A large gourmet galley greets you to starboard as you come down the companionway hatch. Chefs always demand counter space on either side of the sink and cooktop and the Catalina 400 delivers. There is plenty of deep storage and lots of refrigerator and freezer space. There is even a designated storage spot for trash. This galley works! The aft cabin of the Catalina 400 is palatial, stretching all the way across the beam of the stern with a centerline queen bed and comfortable seating, nightstands and storage on both the port and starboard. The aft cabin has direct access to the aft head. The aft head is located just inside the companionway hatch to port, aft of the nav station. It is a large head that can be divided with a shower curtain to a separate shower space. There is dual access from both the salon and the aft cabin. The forward cabin has a wide v-berth that comfortably sleeps two. This cabin also has air conditioning and heat as well as an en-suite private head. With storage, large opening ports for ventilation and light, overhead lighting and personal reading lights, the forward cabin offers a comfortable place to relax after a day of sailing. The nav station is centrally located just inside the companionway, aft of the port salon settee. A Garmin GPSmap 127C chart plotter, stereo control, VHF radio, flat screen TV and the main electric panel are all right above the chart table. The chart table seat swings out for easy access.